The appeal of these friendly creatures is undeniable, bringing smiles to the faces of the kids that play with them. Rats and guinea pigs in particular are considered excellent starter pets for children, hardier than their smaller gerbil, hamster and mouse cousins and less fearful of human interaction as well. Rabbits are also warm, sweet animals but need a little more coaxing and soothing. All these pets are wonderful in any type of family and will adapt to the schedules and lifestyles of their loved ones. Rabbits are vegetarians so their droppings are not stinky and very easy to clean up. They are fastidiously clean like cats and are also easily litter trained. Although they definitely love company, they can be left alone during the day so they fit in well with families that work. 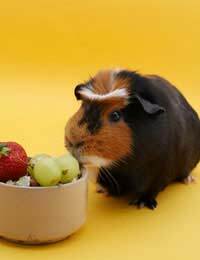 Guinea Pigs don’t bite, are easy to handle and are very low maintenance, so they make good first pets for children. They are active in the late afternoon and early evening, another plus for children in school. Rats are completely adaptable and will socialise and sleep whenever suits the family schedule. In fact, they are such social animals that they can be taken out of their cages, ride around on their owner’s shoulders hang out with different family members for hours and never get tired of being handled. This makes them one of the best family pets among small animals. Rats are also much more resilient than gerbils, hamsters and other small animals, which makes the chance of accidental harm far less. Rabbits and guinea pigs are incessant chewers and therefore disastrous to cords, cables and wires. Parents will have to pet proof the house before allowing access. Rats can also harm themselves by getting into places they shouldn’t if allowed free run of the house. Rabbits do not respond well to being hugged too hard and get VERY uncomfortable when picked up. They are easily frightened and will kick with strong legs if scared while being held, which can result in dropped, damaged rabbits and hurt kids in a worst case scenario. It takes a lot of patience and effort to get a rabbit to feel safe so it’s best if they can be petted while on the ground. Guinea pigs tend to stay under furniture for long periods of time and hide out. They can be difficult to catch and squeal loudly when uncomfortable. Guinea pigs are also much harder to litter train than a rabbit, which can get messy. Many people have an aversion to rats, which can be unpleasant for children who have to defend them. The chances of a small pet being stepped on, accidentally squished or roughly handled are far too great to make this a beneficial match. Unlike birds and fish, which have an esthetic appeal even small babies can appreciate, caged animals are either boring when they burrow or frustrating when held out of reach. Save these pets until your kids are a little older. Once parents have instructed their kids on how to hold and respect the small bodies of these pets, a delightful relationship can begin. Remember to supervise the interactions of pets and children at this age, it’s still possible that kids can get rough and hurt their pets or themselves. Rabbits are particularly susceptible as their large, sensitive ears make them targets of painful handling and they may kick or wound your child in an effort to get away. If these factors are kept in mind, both your kids and pets will thrive off this connection. At this age, children can be left unsupervised and can freely play with their pets. Let the games begin! Building toys and play areas for these pets stimulates a child’s imagination and sense of creativity, thrilling their furry friends at the same time. A perfect pairing.